Belleek China Echinus Bowl is a footed piece that features extraordinary detail along with pink accenting. This astonishing covered bowl was designed as part of the Prince of Wales dessert service, representing one of the first major commissions for the Belleek Pottery from the Royal Family. The notoriety that resulted quickly generated requests from other prominent collectors, thereby enhancing Belleek’s already renowned reputation. Belleek’s Robert Armstrong patented these designs, which were eventually registered on September 6, 1868. The Echinus footed bowl was produced up until the 1920s, retired, and then reintroduced in the 1950s. Again it was retired in the 1970s and remained in the archives until the 150th anniversary year of Belleek in 2007. This Belleek bowl is named Echinus and it features a covered vessel that is supported by three figurines. 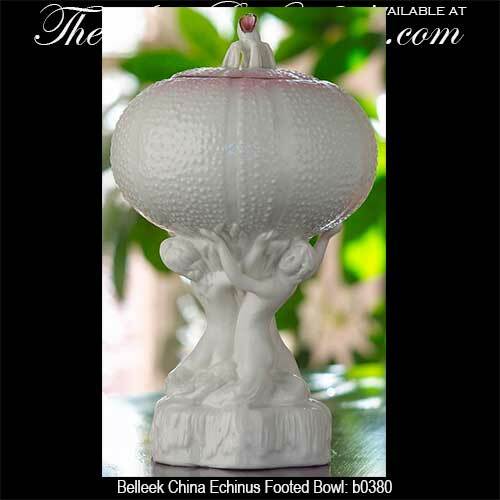 The fine china Belleek bowl is enhanced with pink accenting and stands 8 1/2" tall. The Irish bowl is handmade and hand painted in Belleek, Ireland and it is a limited edition of 350 sculptures. The Belleek Echinus Bowl is gift boxed in its original packaging, complements of The Irish Gift House.